Mobile devices make it easier for you to manage the information you need wherever you are. However, if you store information on your smart phone, you may find yourself in a bind when you only have your laptop and you can't access it. Install this program on your devices, and access the information from any of them. This creates a virtual desktop, allowing you to get files and manage programs. You get 100 GB of space for only $3.99 per month, and you can try the service for free. Sync all your devices quickly by putting all your folders and files in one place. You don't have to worry about missing any information because you left it on another device Plans start at $4.99 per month for 30 GB and go up to $24.99 per month for 250 GB. Dropbox is a leading cloud-storage service that allows you to access important files, photos and videos anywhere. You can also share your information with authorized users. The basic service is free, but you can upgrade to a paid membership for additional storage. 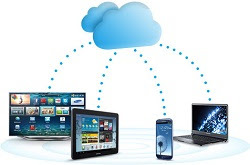 Remember everything and make it available to any device. This note-sharing tool allows you to save ideas, photos, websites you like and more and save them to a web-based account. The service is free, and it's a great way to sync your data and to get better organized. What tools do you use to keep your devices synced and to ensure access wherever you are? Share your picks in the comments! Tara Spenser is currently the resident writer for workingcapital.org, where she researches the most affordable cash advances for business available. In her spare time, she enjoys blogging, swimming and being a mom.